New Delhi: CBI Special Judge Arvind Kumar on Wednesday ordered 10 days judicial custody till December 28 of Christian Michel, the alleged middleman in the high-profile Rs 3,600 crore AgustaWestland chopper kickbacks case. Order on the bail application of Michel was reserved till December 22, Saturday.The 57-year-old British national was today produced at New Delhi's Patiala House Court before the Judge on completion of his four-day CBI custody. Indian Air Force had floated a proposal in 1999 for acquisition of 12 VVIP helicopters to ferry top Government functionaries. The deal was granted to AgustaWestland in 2010 for over Rs 3,600 crore. It was alleged that bribes were paid to tweak technical specifications, including lowering of the service ceiling of the helicopter from 6,000 m to 4,500 m to help AgustaWestland win the bid. Long wait Central Bureau of Investigation had registered an FIR on March 14, 2013 and named former IAF chief S P Tyagi and 12 other individuals as accused apart from four companies. Besides the Tyagi family, three middlemen Michel, Carlo Gerosa and Guido Haschke were arraigned as accused. Christian Michel was among the alleged middlemen who had brokered the deal. Investigators claim that he paid bribes to officials and politicians to swing the contract in favour of AgustaWestland, the British arm of Italian firm Finmeccanica. Directorate of Enforcement also began a probe in this matter under the provisions of Prevention of Money Laundering Act after the First Infromation Report of CBI.CBI had alleged in this matter that amount of Euro 42.27million was paid by the Finmeccanica Group to the firms of Christian Michel James as kickbacks or bribe. It further alleged that while Gerosa and Haschke paid off members of the Tyagi family Michel was dealing with Ministry of Defence bureaucrats and politicians. Indian agencies were chasing Michel in this case. 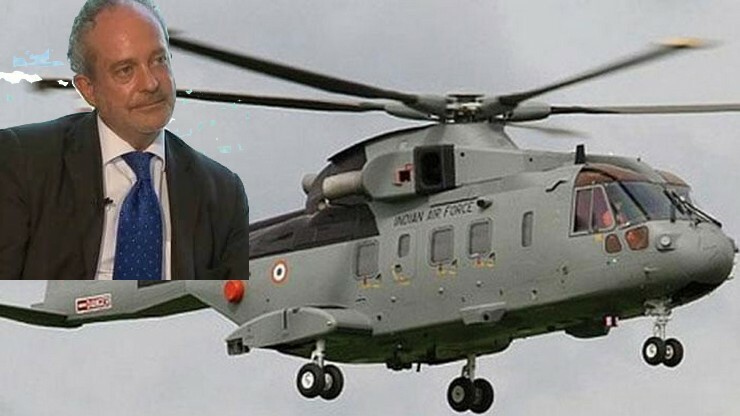 CBI wanted Michel for interrogation but he was deliberately evading the agency and his presence became possible after six years of his alleged involvement in the purchase of the VVIP helicopters surfaced in 2012, six years ago. Special CBI Judge had issued a non-bailable warrant of arrest against Michel on September 24, 2015 and on its basis Interpol put out a Red Corner Notice on November 25, 2015 against him. He was finally arrested by the United Arab Emirates authorities in February 2017, a year ago. CBI had filed a charge sheet in the court on September 1, 2017 against Michel and 11 others and a request for extradition of Michel was forwarded to the UAE Authorities on March 19, 2017, more than a year ago. A Court of Dubai on November 19, 2018, upheld the decision for extradition of Michel to Indian authorities to face legal proceedings against him and at last he was brought India. CBI had alleged in the matter that Michel had entered into as many as 12 contracts through two of his Firms namely, Global Trade & Commerce Ltd. London and Global Services FZE, Dubai, UAE with Finmeccanica, AgustaWestland, Westland Helicopters UK to legitimise the illicit commission. The agency today opposed the bail application of Michel, submitting that the investigation was at a crucial stage and he might flee. He had already tried to escape from Dubai just before his extradition. CBI contended that Michel was an influential person and had links with senior bureaucrats and other politicians who are witness in the case. Further more, he had not cooperated with the investigating agency, so the bail application of the accused may be dismissed at this stage. Counsel for Michel submitted before the court that he was not required for custodial interrogation and no purpose will be served by keeping him behind the bar. Defence counsel maintained that Michel had always cooperated with the investigation agency and was ready to abide any condition put by the court while granting the bail. Other accused had already been granted bail by the court. Michel is liable to be granted bail in the matter on grounds of parity. The ex-IAFchief, SP Tyagi, another accused today filed a application seeking permission to go abroad. The court directed the CBI to file reply on December 22, Saturday.